Social media driving you mad? 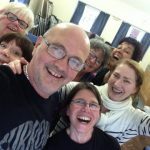 How laughter yoga helps. Do you sometimes find social media is a chaos-theory series of infinite rabbit holes? With distractions that spin off from distractions? 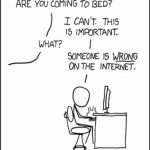 Full of people being ‘wrong’? Do you find sometimes you get sucked in? Write hasty and ill-advised comments? Do you want to change all this? 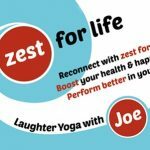 I have learnt to use my laughter yoga (almost!) all the time on social media and email. 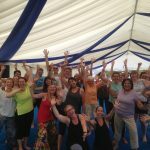 While laughter yoga is often viewed as a ‘Marigold Hotel’ slightly zany group activity – not that there’s anything wrong with that, of course – it can also be adapted into individual, pragmatic day-to-day working practices. The key is figuring out how to turn group ‘laughter exercise’ activities into personal practices for computer work. First, laughter does not have to be out loud. We can laugh silently, on the inside. With practice, it becomes something we feel. It has the capacity to lighten our mood. When we develop our awareness sufficiently that we realise we are getting distracted, losing our focus, getting fired up, we can use silent, internalised, invisible laughter to help us refocus and calm down. Do a silent, invisible laugh now and see how you feel? Does it change your mood at all? Do you feel more present? Notice whatever you’re feeling. The more often we take the time to notice being present, the easier it becomes – even and especially on social media. With practice, smiling triggers this same change in mindset. Smiling while writing helps prevent over-seriousness and over-thinking. Smiling exercises are core laughter yoga exercises and over time, help us re-wire our brains so we naturally and genuinely smile more. The relevance here is to remember to do this when at your computer. The smile can be gentle and almost imperceptible, a slight upward-turn at the corners of your mouth, a slight crinkling around your eyes, a slight lifting of your eyebrows. Fortunately, your brain recognises all these signals and responds accordingly, with among other things, a lifting of your mood. As before, why not do it now and observe any differences you experience? Remember to be embodied. Moving deliberately and consciously aids embodiment, and transforms social media and computer time. How can we feel our embodiment while at our computer? Stretch. Any stretch will do. Just do it. Feel. Feel your feet, feel your ‘seat’. The practice is to be aware of these areas while on your computer. Wriggle your toes, move slightly on your chair, enough to be aware of sensations here – and notice any change in mindset. Remember to breathe. We are all likely to have heard this adage many times before. It is easy and sadly common for our breathing to become shallow, especially when at the computer. Remembering to take deep breaths, and from the belly, helps us refocus, break free from distraction and alleviate any over-thinking tendencies. It can also help calm us which is sometimes important? We all need to remember this sometimes? The goal is to embed these practices into out psyche so that we start to use them unconsciously. Practice smiling continuously when composing an email. Make a point of smiling and being aware of the soles of your feet while scrolling through your newsfeed. Remember to smile and breathe deeply when receiving notifications. Practice silent invisible laughter when replying to comments. Contact me if you’d like a one-to-one to embed these techniques yourself if you want to use social media more effectively and productively. [ As a core present-moment practice, I have a 2-minute Move / Breathe / Smile video. PS Remember to sign up if you’d like these blogs direct to your inbox? 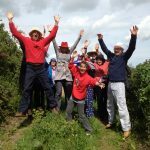 This entry was posted in Laughing Yogi, resilience and tagged mindfulness, resilience, smiling, stress management on July 4, 2018 by Joe Hoare. All emotions are welcome in my laughter yoga sessions. Even when I don’t specifically articulate this, it remains true. Sometimes, partly as a result of this emotional freedom, personal breakthroughs occur. Sometimes a natural joyfulness gets activated and a sense of wellbeing and unique personal identity breaks through. When this happens, the person has felt something they have never felt before, they recognise on a profound level this experience is important to them, and that from now on, their life is different – including less stress & anxiety and more joy & happiness. This is a ‘death of the ego’ moment, aka emotional catharsis. This ‘death’ is the shedding of a skin because they have been touched sufficiently deeply, at that right moment in their life, that they emerge from the session a changed person. They are transformed, but to experience that transformation, part of them has to ‘die’, and this is an emotional moment for them, with or without tears. It is an honour, a privilege and a responsibility to be present at and help initiate this personal alchemy. Two recent experiences struck me forcefully because they were so similar they were almost identical. One happened on a 2-day course, the other in a 1.5 hour session. In both cases, as the particular individuals were recounting their experience and how they had been changed by it, all emotions, from pain and sorrow through to joy and delight, fleetingly crossed their face. In the space of probably less than 2 seconds, this intense microcosm of emotion was clearly if fleetingly expressed as they completed their personal alchemy. They had both made this breakthrough step without going into emotional meltdown, and yet strong emotion was being expressed. Among other things, it is good for all practitioners to be comfortable in the presence of strong emotion. It is a wonderful thing to experience, and a wonderful gift to help birth, is it not? Do you have any experiences to share? Would you like a 2-minute video with 3 basic Move / Breathe / Smile exercises? Email me joe@joehoare.co.uk for your free copy. This entry was posted in Laughing Yogi, laughter yoga, mindfulness and tagged anxiety, depression, happiness, laughter yoga, mindfulness, nls: natural laughter skills, resilience, stress management, wellbeing on November 9, 2017 by Joe Hoare. 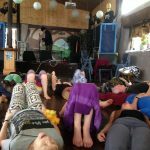 Living passionately in ‘interesting times’ – how does laughter yoga help? Do you remember the old Chinese curse: ‘may you live in interesting times’? These times are with us now, so how can laughter yoga help? Laughter yoga uses laughter as a practice. 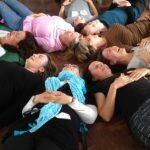 It uses is as a yoga, to reconnect and harmonise. We breathe better. We oxygenate our blood. We improve our circulation. The net result is we feel energised. When we feel energised, we start to feel passionate. Whether done as alone or with others, it works. Passion sustains us when we encounter difficulties. It is empowering. It builds our resilience and helps us keep going when problems arise, as they always do. A regular and daily laughter practice actively boosts our ability to live passionately. Keep doing this and you will become energised, you will experience how your passion follows your energy, and consequently you feel in better control of our life – even in ‘interesting’ times. A basic practice is: breathe in, pause, smile, and in a good-natured way, chuckle as you breathe out – pause, feel. While it essential to take what we do seriously, especially nowadays, it is equally important not to take ourselves too seriously. When we take ourselves too seriously, our ‘message’ becomes ‘heavy’ rather than ‘light, and so we undermine it. This is particularly jarring in laughter yoga where the aim is to promote joyfulness, connection and open-heartedness (among other qualities). To start taking ourselves less seriously, practice laughing at yourself. A basic practice here is to look in a mirror, remind ourselves of all our foibles, point at ourselves, and have a good-natured chuckle. Learning to laugh at ourselves is liberating for others as well as ourselves. Let go & be more flexible. “When the facts change, I change my mind. What do you do, sir?” John Maynard Keynes. It is a useful exercise to imagine circumstances being different, reversed, in a different order – just to see what insights occur to us, and therefore how we might do things differently. When we feel energised and passionate, it is easier to start imagining the previously unimaginable without feeling too threatened. When we approach this reviewing process as a game and engage with it playfully, it becomes easier to be open-minded and consider new ideas and possibilities. A quick and easy way to become more playful is to move around playfully. 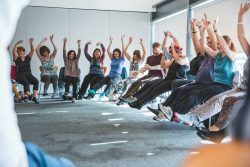 We become energised when we spend a few moments being physically active, and combining this with playfulness moves us quickly into an open-minded and creative space. If you’re not sure how to, think of Monty Python’s Ministry of Silly Walks? 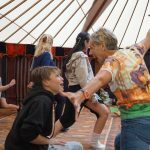 The value of this flexibility, in combination with passion and playfulness, is it helps us adapt more easily as life changes, which is why laughter yoga is an effective tool for contemporary living – just keep practicing. 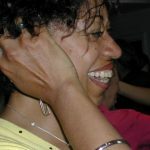 This entry was posted in Connection, happiness, Laughing Yogi, laughter yoga, mindfulness, nls: natural laughter skills, stress and tagged anxiety, connection, depression, emotional intelligence, happiness, laughter yoga, mindfulness, nls: natural laughter skills, positive psychology, psycho-neuro-immunology, resilience, smiling, stress management, wellbeing on December 14, 2016 by Joe Hoare. This is the most common reply I get to the question ‘how do you feel when you laugh?’, and the reason is because there’s magic in laughter. When we laugh in an open and good-natured way, we are experiencing a moment of joy, of present-moment awareness, and quite possibly exuberance. In such a moment, we are enjoying our life, so we feel better. This experience is the antidote to stress, anxiety, worry and worse. Psychologically, it builds our resilience because feeling good is an empowering experience. ‘Feeling better’ feeds our resourcefulness and helps us deal better with life’s challenges. It improves our mental health, and gives us a more positive and optimistic outlook. Fortunately, optimism is a quality we can all develop. Psychologically, we need to go through a process where we challenge our non-optimistic thoughts and feelings, and based on our own experience, replace them with more realistic and accurate ones. This is proven current psychological practice and at the heart of several approaches to improving mental health. Laughter yoga helps these processes. There is a simple laughter yoga exercise which involves smiling. In this exercise, you smile a genuine and good-natured smile for 10-15 seconds, ideally at yourself in a mirror. Doing this usually requires a psychological shift because to keep your smile genuine (ie not false and insincere), you have to you take control of your mood and put it into a good-natured state. This is brain-training, and can be transformative. 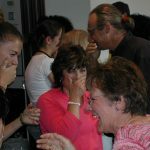 Laughter yoga is often thought of as a group activity, and it usually is. However, as with almost every other practice, it is one that can be on your own too. Learning to keep the practices going when on your own allows the benefits to deepen and grow. 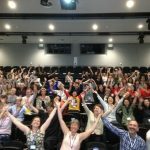 So, even on our own we can use laughter yoga to improve our mental health. 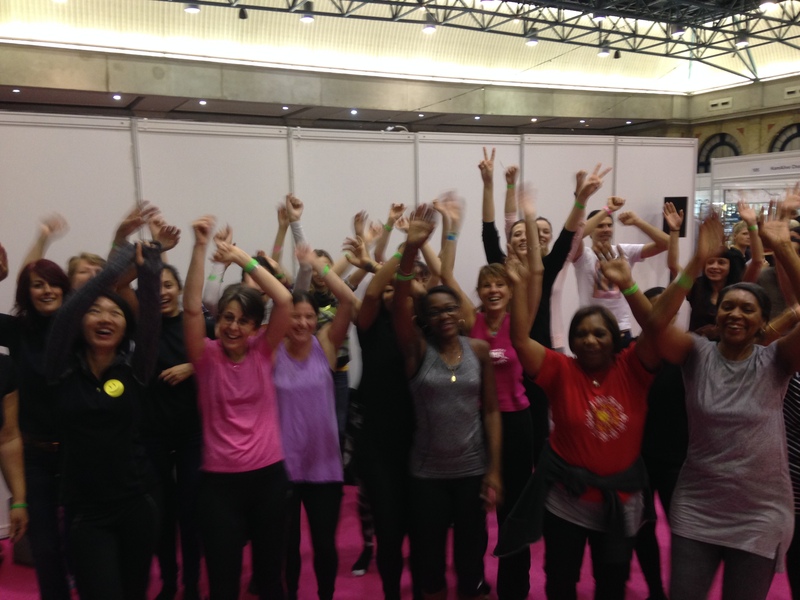 However, laughter yoga is also a group activity. 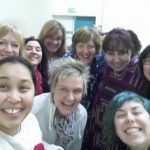 When we do our laughter yoga in a group, it builds connection. 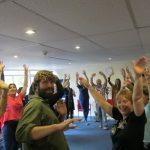 One of Dr Kataria’s great insights at the outset of laughter yoga was that when we connect with someone else while doing laughter yoga, we become more playful and spontaneous and therefore even more good-natured. Connection is an antidote to loneliness. 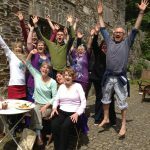 Because loneliness is a major contributor to mental ill-health, the group activities of laughter yoga also help promote mental good health. But there is much more to laughter yoga than just the psychological aspect. Laughter yoga is a mind-body / body-mind activity. It also uses physical activity and exercises to energise us, and to help us engage with our innate playfulness. The mind-body / body-mind quality helps activate the biochemical changes on several levels simultaneously, and these changes have been shown to have benefits that can last up to 24 hours. All we need do is keep topping up the benefits. Even better is to do this exercise in a mirror so you’re smiling at yourself. If you find this too difficult at first, just do the simple smiling. It’s the 10-15 second aspect that’s important. At the end of your day, repeat this exercise. Before going to sleep, write down 3 things you’ve appreciated and/or been grateful for today. During the week, please be on the lookout for signs that life might be going better. These signs can be easy to miss: an unexpected feeling of comfort; feeling more relaxed in a previously stressful situation; some enjoyment; thinking differently. However small, keep alert for these indicators that life is going better, and write them down. I hope this simple laughter yoga exercise has the same benefit on your mental health as it has on mine and thousands of others. This entry was posted in Connection, depression, happiness, Laughing Yogi, laughter yoga, mindfulness, psychology, stress and tagged anxiety, connection, depression, endorphins, happiness, laughter the best medicine, laughter yoga, mental health, mindfulness, nls: natural laughter skills, positive psychology, resilience, smiling, stress management, wellbeing, World Mental Health Day on October 10, 2016 by Joe Hoare.